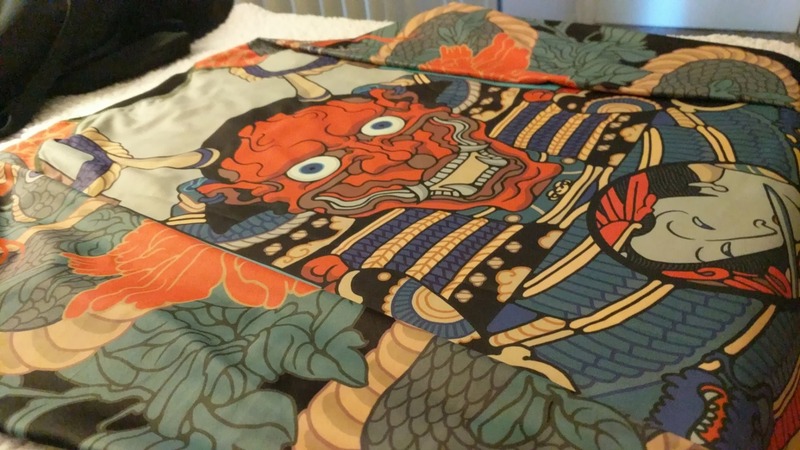 This design, with its brush stroke art, vivid colors, and a traditional Japanese aesthetic, pays homage to the Oni demon of Japanese mythology. The Oni is a class of yokai, or Japanese demon, and is depicted as being similar to an ogre of European mythology, but having a wild mass of hair, insidiously pointed nails, random horns jutting from their heads., and grotesque digits. Initially believed to be evil spirits, but in some folktales, they are in fact good spirits and assist travelers and wayfarers. What that says to me is that spiritually there seems to be no black and white, but only gray, when it comes to principles such as ethics. It's also believed that if you are humble and respectful, these spirits will be more willing to assist you, which is the standard we should always hold ourselves to, the epitome of humility and respect. The rashguard fits very well and looks super cool! I couldn't be happier with it! Highly recommend. I am 5’ 9’’ with a muscular build and this fits with some wiggle room. It’s not obnoxiously tight. Great fit and the graphic is so dope! Beautiful graphics and great quality material. I love this rashguard so much! I did buy the wrong size, so I have returned and I am waiting for them to re-stock. I can see why these rash guards are in such high demand. The material quality feels amazing, I’m very excited to receive the right size and train in this ONI Demon - BJJ Rashguard. I am an AUS 8-10 (women’s) I originally bought a small, it was too big. So I am going to go for the XS. Thank you Yudansha for your unique and beautiful range. High quality product and fast shipping! Will purchase again. great quality. Im 170lbs and bought a Large.